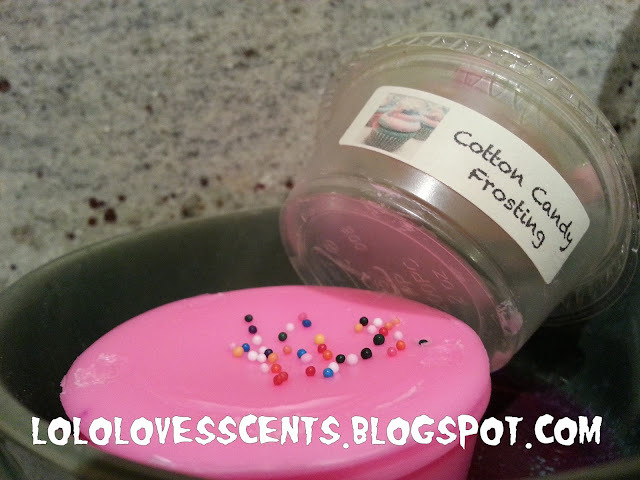 The Redolent Mermaid: Guest Post: Lauren Reviews Beezy "Cotton Candy Frosting"
Guest Post: Lauren Reviews Beezy "Cotton Candy Frosting"
Lauren is my friend and blogger over at LoLoLovesScents and has generously written a review post for me while I am away on vacation. Her blog is one of my favorites and I do hope you hop over and check out her posts. First of all, I want to introduce myself for those that don't know me. I am Lauren from Lolo Loves Scents, and I have been buying online vendor wax for about 3ish years now. I wanted to first take the time to thank Julie for letting me guest post on her blog, it is one of my favorites. She has become a great friend of mine and not just within the wax community! So thanks, J, for letting me post today! Have anyone ever had cotton candy frosting?? Because it sounds heavenly. Overall Rating: 7.5/10; tooth-achingly sweet, but in a good way. Very accurate to actual cotton candy smell. I melted this in my bathroom and has medium-high luck with throw and the smell while it was warming. Permeated the air so it smelled like a candy shop. Delicious, invocations of a county fair. Needing better photographic skills. Sprinkles are so adorable, but are a pain to remove from warmers sometimes because they get crusted/burned to the bottom! Bright pink wax. Beezy is one of my favorite vendors, but he doesn't stock all the time. Don't just a scent by its cold sniff smell!